This delicious jam is a perfect foil for roast beef, cheeses such as cheddar, and cold cuts. It is also delicious with Rachel Allen's mini Yorkshire puddings recipe. Melt the butter in a saucepan on a medium heat, until it becomes a deep nut-brown colour – be careful not to let it burn. Add the onions, sugar, salt and pepper; stir well. Cover, reduce the heat to low and cook for 30 minutes, stirring from time to time, until the onions are completely soft and caramelised. Add the vinegar, wine and cassis. Cook, uncovered, for another 30 minutes, stirring occasionally. Pour into a serving bowl to use immediately, or put into a sterilised jar. 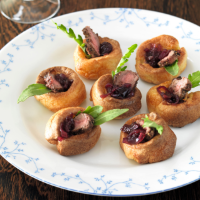 Serve with Rachel Allen's mini Yorkshire puddings.